Gone are the days of turbo boredom, when you’d spend hours sitting on a static bike doing Z2 workouts while watching Netflix. Online training now allows you to replicate real-world training efforts (like hilly workouts), and you can do them perfectly — there is virtually no room for error. All you have to do is pair your smart trainer to your computer or mobile device before your workout and you can do exactly what you need to do. Just like riding outside, you can also see how you compare against the people you ride with online, which adds a great social aspect to cycling indoors. Instead of spending dreary days stuck in the garage with only a fan, you can ride with your friends, pros, and like-minded strangers across the globe. What features stand out on the Zwift platform as particularly useful? Why? Living in Italy, one of the biggest pluses of using Zwift is that I can ride with my friends, old club mates and occasionally clients across the globe. With a quick bit of messaging you can join a ride — it’s as simple as that. 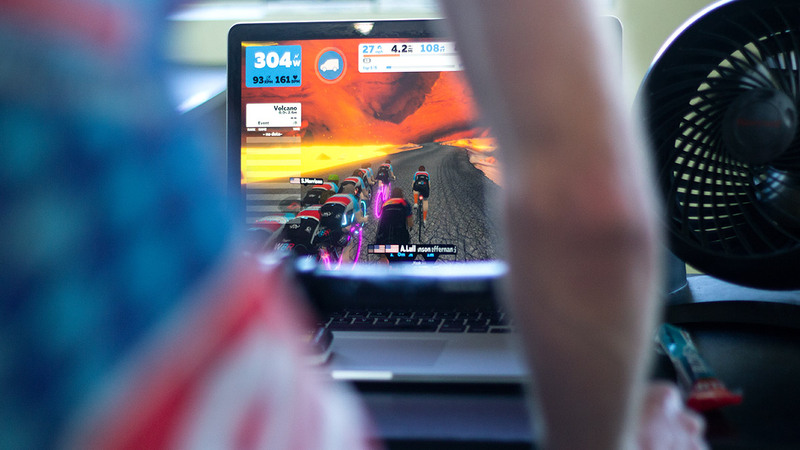 While you occasionally may be a bit limited with where you can ride in the real world, there are plenty of options on Zwift to keep you entertained with races, group rides, and even Strava segments available. You can even occasionally catch professional cyclists Zwifting! Zwift also offers lots of training plans to choose from, so at least one will suit your needs—it also syncs with TrainingPeaks so if you’re using a training plan there, it will cross over. There are even plans to help you train for specific events, like a century ride. Once you’re switched into “workout mode,” the computer will handle the structure of your workout, power values, and if working with a smart trainer, even the resistance. Zwift brings real targeted training all within your reach. What features stand out on the TrainerRoad platform as particularly useful? Why? Working with power can give you powerful insights into your training, but not everyone can afford to buy a power meter. Luckily TrainerRoad will calculate an approximate “virtual power” value for you based on live speed data. It’s also compatible with most computers and really easy to use. TrainerRoad also offers training plans, and some are supported with helpful videos. The app will offer technique suggestions at the end of your session, and you can calibrate the resistance of your session. If you’re struggling to reach the numbers during your workout in ERG mode, you can knock it back a bit, like changing gears on the bike. TrainerRoad also syncs with TrainingPeaks, so once you’ve picked a training plan it will calendar all your workouts — all you need to do is jump on your bike and pedal. The only real downside is that you can’t transfer the workout if you want to go outside. Are there any potential downsides to using either Zwift or TrainerRoad? The major downside of using virtual training is that it can become so addictive that you forget how much fun riding outside can be! Also, while we can work really effectively with structured training and controlled power outputs while training indoors, translating this to performance outside isn’t a given. For example, if you’re working on climbing, your power meter is not going to be controlled by ERG mode — it will be controlled by you. If you’re not used to doing this, it can come as a bit of a shock. You also won’t get as much practice in varying your position on the bike, or developing cornering and descending skills. It’s great to stay indoors, keep dry, and ward off the possibilities of getting a cold, but if you don’t practice occasionally riding in bad weather, what will you do if you get caught in the rain mid-race or ride? It’s good to develop these skills, as the weather isn’t always predictable, and sooner or later we’ll all end up riding in less-than-optimal conditions!